In re Chudik, [2016-1817] (March 27, 2017), the Federal Circuit reversed the PTAB’s determination that claims 1, 15, 18, and 33–40 of U.S. Patent Application 11/525,631 on an implant for shoulder replacement surgery were anticipated. The rejected claims required “a shell having a protruding surface on a first side arranged to engage the surface of a cavity formed in a glenoid extending between peripheral glenoid surfaces. The PTAB affirmed the rejection because claims did not require the recited surfaces engage the specified glenoid regions; rather they require only that the recited surfaces be arranged for such engagement. A patent claim is invalid for anticipation under 35 U.S.C. § 102 when a prior art reference describes each and every claim limitation and enables one of skill in the art to practice an embodiment of the claimed invention without undue experimentation. However, a prior art reference that must be distorted from its obvious design does not anticipate a patent claim. The Board found that because the surfaces of element of the prior art “can still be arranged to” engage the glenoid regions, it anticipated the claims. However the Federal Circuit rejected this finding, noting that while the claim language could imply that the protruding surface on the flat side need not always actually engage the glenoid cavity surface, it must be at least capable of doing so. The Federal Circuit found that the prior art ’s protruding surface cannot be arranged to engage the glenoid cavity surface without reconfiguration. The Federal Circuit said that prior art that “must be distorted from its obvious design” does not anticipate a new invention. The Federal Circuit reached a similar result with respect to a second reference because this endeavor would constitute a significant and impermissible modification of the prior art. In University of Utah v. Max-Planck-Gesellschaft Zur Foerderung der Wissenschaften E.V., [2016-1336] (March 23, 2017), the Federal Circuit affirmed the district court’s finding that the case was not exceptional March 23, 2017, within the meaning of 35 U.S.C. § 285 and denying Max Planck’s motion for $8 million in attorney fees. article. Dr. Tuschl read Dr. Bass’ minireview, recognized her hypothesis that 3’ overhangs may be relevant to RNAi, and tested that hypothesis, and made the claimed invention. alleged collaboration between Dr. Bass and the Tuschl that occurred over several conversations at various academic conferences. The Federal Circuit listed a number of admissions during Dr. Bass’ deposition that directly contradicted the University of Utah’s allegations that Dr. Bass collaborated with the Tuschl II inventors. The Federal Circuit noted that the only supported allegation was that Dr. Bass and Dr. Tuschl met for dinner during a conference. The district court reasoned that there was no evidence to support a finding of collaboration between Dr. Bass and Tuschl. While Dr. Bass’ mini-review was integral to the Tuschl inventors’ research, the mini-review was in the public domain by the time Tuschl relied on it. The district court concluded that Tuschl’s reliance on the mini-review could not, on its own, support a finding of collaboration, and was not included to find that the discussions at an academic conference could constitute the collaboration needed to establish joint inventorship. The trial judge was in the best position to understand and weigh these issues. She had no obligation to write an opinion that reveals her assessment of every consideration. This court will not second guess her determination. Although it played no role in the appeal, one has to wonder whether the $8 million in attorneys’ fees requested by Max Plank, which the district court called “jaw-dropping,” figured into the district court’s evaluation of the claim. When the district court said that “it is not grossly unjust to require Max Planck to bear its own costs,” was the court thinking that if it really took $8 million to defeat the University’s claims on Summary Judgment, were they really so exceptional? In TVIIM, LLC v. McAfee, Inc., [2016-1562] (March 21, 2017), the Federal Circuit affirmed jury verdicts that U.S. Patent No. 6,889,168 was invalid and not infringed because substantial evidence supported the jury’s findings, and the district court did not abuse its discretion in denying a new trial. vulnerabilities” have more than one ordinary meaning. However, the Federal Circuit noted that TVIIM did not seek construction of any of the terms, and never asserted that the terms had multiple meanings. The Federal Circuit said that TVIIM cannot be allowed to create a new claim construction dispute following the close of the jury trial. THe Federal Circuit went on to find that substantial evidence supported the jury verdict. In Bayer Cropscience AG v. Dow Agriscience LLC, [2015-1854] (March 17, 2017), the Federal Circuit affirmed affirmed the award of attorneys’ fees under 35 USC 285 to Dow, holding that the district court did not abuse its discretion in finding the case exceptional. In its decision awarding attorney fees, the district judge found that Bayer’s arguments were “fallacious” because they were “implausible” and “made no business sense” in light of the facts surrounding the agreements and their negotiation. The Federal Circuit noted the conflicting testimony of one of Bayer’s executives, and inconsistent emails to Bayer’s position that Dow was not licensed to commercially exploit Bayer’s genetically modified soybeans. The Federal Circuit noted that abuse of discretion is a highly deferential standard. It said that the district court applied the correct legal test under § 285, examining the totality of the circumstances to determine whether the case stood out from others. The Federal Circuit found that the district court’s opinion thoroughly demonstrated the totality-of-the circumstances approach, detailing the reasons why Bayer’s positions on the merits and litigation tactics coalesced in making this case, in its judgment, exceptional. The Federal Circuit approved pre-suit diligence as a factor in the totality-of the-circumstance approach, and found that the district court did not abuse its discretion in concluding that Bayer failed to perform a diligent presuit investigation of its claims against Dow. Rejecting Bayer’s other arguments, the Federal Circuit affirmed the district court. Given that a settlement (presumably), a request for adverse judgment, and a finding of patentability are all good outcomes for the patent challenger, patent challengers have “won” 58.4% of the time, and when you add in invalidation at least some of the time, then the patent challenger improves its situation 63.9% of the time. The odds are even better for petitioners who do their homework and present a grantable petition. For petitions for which trial is instituted, the challengers win 77.8% of the time, and at least improve their situation 86.4% of the time. In Thales Visionix, Inc., v. U.S., [2015-5150](March 8, 2017), the Federal Circuit reversed the Court of Claims determination that the claims of U.S. Patent No. 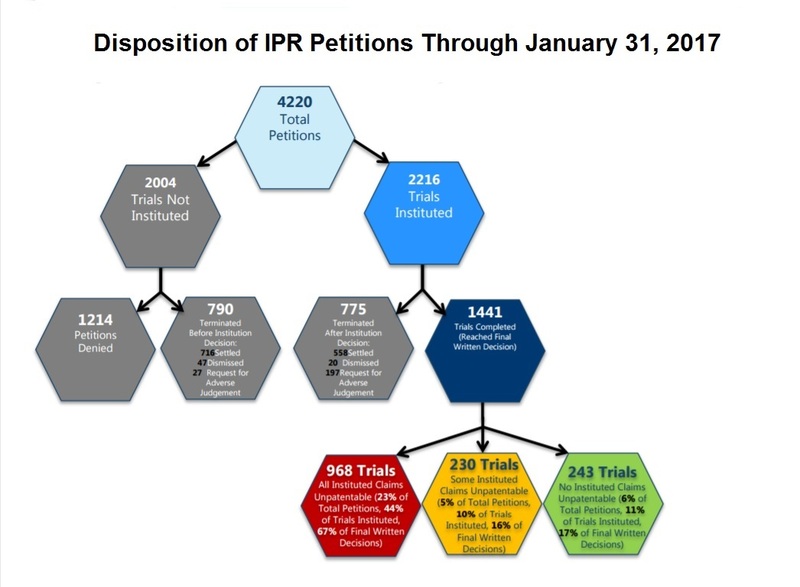 6,474,159 were directed to patent ineligible subject matter. The Federal Circuit observed that the Supreme court “has not established a definitive rule to determine what constitutes an ‘abstract idea. '” Because all inventions at some level embody, use. reflect rest upon or apply laws of nature, natural phenomenon, or abstract ideas, the Federal Circuit said it was important to articulate what the claims are directed to with sufficient specificity to ensure that the step one inquiry is meaningful. The Federal Circuit looked to Rapid Litigation Management, Enfish, and Diamond v. Diehr, and concluded that for purposes of evaluating patent eligibility, the claims in the ‘159 patent were nearly indistinguishable from the claims at issue in Diehr, explaining that just as the claims in Diehr reduced the likelihood that the rubber molding process would result in over curing or under curing, the claims at issue result in a system that reduces errors in an inertial system that tracks an object on a moving platform. The Federal Circuit also (and less aptly) analogized to Rapid Litigation, stating that just as claims directed to a new and useful technique for defining a database that runs on general-purpose computer computer equipment are patent eligible, so too are claims directed to a new an useful technique for using sensors to more efficiently track an object on a moving platform. Editorial comment: the similarity of these two cases is hard to see. That a mathematical equation is required to complete the claimed method and system does not doom the claims to abstraction. The Federal Circuit explained that far from claiming the equations themselves, the claims seek to protect only the application of physics to the unconventional configuration of sensors as disclosed, and concluded that the claims pass Step 1 of the Alice test. In Intellectual Ventures I LLC v. Erie Indemnity Company, [2016-1128, 2016-1132] (March 7, 2017), the Federal Circuit affirmed in part, vacated in part, and remanded in part the district court’s decision finding all claims of U.S. Patent Nos. 6,510,434, 6,519,581 and 6,546,002 ineligible under 35 U.S.C. § 101, and the infringement claim of the ’581 patent for lack of standing. The Federal Circuit concluded that the Alset Agreement did not include an assignment of rights to the ’581 patent and affirmed the district court’s Rule 12(b)(1) dismissal. The Federal Circuit rejected the argument that the language implicitly included the ‘581 patent application. Applying California contract law, the Federal Circuit agreed with the district court’s conclusion that there is no ambiguity within the Alset Agreement that could render it reasonably susceptible to an interpretation that the ‘581 patent application was transferred. The fact that Alset recorded the assignment at the PTO, represented in a terminal disclaimer that it owned all the rights to the ’581 patent, and filed updated power of attorneys and paid the ’581 patent’s issuance fee. The Federal Circuit said that although this evidence may lead one to reasonably conclude that Alset believed it owned the ’581 patent application at some later point in time, it would be error to rewrite the parties’ agreement to include that which was plainly not included. The fact that other pending applications were expressly listed also did not help plaintiff’s cause. Because the Federal Circuit agreed that plaintiff lacked standing to sue under the ‘581 patent, it vacated the finding that the ‘581 patent was invalid under §101. As to the ‘434 patent, which contained twenty-eight claims relating to methods and apparatuses that use an index to locate desired information in a computer database: Under step one of the Mayo/Alice test the Federal Circuit agreed with the district court that the invention is drawn to the abstract idea of “creating an index and using that index to search for and retrieve data. The Federal Circuit noted that it had previously held patents ineligible for reciting similar abstract concepts that merely collect, classify, or otherwise filter data. Under step two of the Mayo/Alice test the Federal Circuit agreed with the district court that they lack an “inventive concept” that transforms the abstract idea of creating an index and using that index to search for and retrieve data into a patent-eligible application of that abstract idea. The fact that the claimed invention employed an index of XML tags was not significant in view of the patent’s admission that such tags are known. Moreover limiting an abstract idea to a particular field does not make the idea any less abstract. The Federal Circuit concluded that the claimed computer functionality can only be described as generic or conventional. of the abstract idea itself.